Kenan Anthony Guleryuz caught this 20-pound striped bass on a swimbait on the Colorado River. 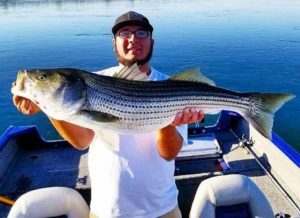 Fall is officially here and it’s time to start thinking different techniques for catching those stripers. Right now Lake Pleasant is only at 36% full which means these fish have been used to staying in deeper water (65-80 feet ) depending on the lake location. They are doing this because they want the cooler water column and the deeper water produces more oxygen opportunities compared to those coves or arms of the lake that are extremely shallow and warm. The good news is as the air temps cool off going into future weeks the water temperature will start to decrease as well. This will start to move the fish into shallower water. This means more opportunity for catching these fish on top water lures and other artificial lures. Striper get very active late September and early October by chasing and gorging on live bait. Keep an eye out for boils and sporadic water activity. Best recommendations for lures are, Chrome Kastmasters, Heddon Spooks bone or clear in color. Skinny dippers, Paddle tails in white or shad color. My favorite lures are the Lucky Craft “Sammy” and the ASF Paddle Tail & Spitter lures from Gill Reaper lures. Many anglers have knocked them dead on all these lures. Temperature changes also means the more opportunity to successfully cast net for live threadfin and gizzard shad. The bait fish will be more shallow going into future weeks as well, which will make it easier for the anglers to cast net this ideal bait. Most anglers are using a dropshot or Carolina rig set up with a size #1 or #2 bait or circle hook. The benefit to using live bait is it increases your chances for better bites and bigger fish compared to the extremely light tap bites that anglers are experiencing with dead bait. So get out on the water and enjoy the night fishing while temperatures are still comfortable and mild and be sure to take advantage of live bait, and artificial lures this Fall. For more information, free future workshops and other helpful tips, please feel free to check us out at Arizona Striper fishing on Facebook. A fishing community group with over 3,700 local members to help provide support, and advice so you can have more success on the water. Tight Lines!